Tory Historian wanted to see the year out with some spectacular birthday or anniversary. Nothing much seems to have happened on December 31 and the birthday of Charles Edward Stuart, the Young Pretender, hardly seems worth celebrating. So let us look to December 30, the birthday of one of the finest poets and writers, Rudyard Kipling. Happy 145th birthday, Mr Kipling. History Today enters into its 61st year with an interesting looking issue. Tory Historian has just finished another book that might be of interest to people who are interested in conservative history and its ramifications. The Third Marquess of Londonderry and his second wife, Frances Anne Emily Vane-Tempest, une femme formidable according to all including Disraeli, spent several months in Russia in the winter of 1836-7, visiting St Petersburg and Moscow as well as a few smaller places, attending many balls, dinners and receptions, being friendly with the Emperor Nicholas I and his family as well as a large number of Russian and foreign aristocrats and generally exploring many sights and events. Lord Londonderry, the Lord Stewart mentioned in several of Georgette Heyer's novels, a distinguished soldier and diplomat who had, as an "uncompromising Tory", fallen foul of The Times by the early 1830s, published an account of the trip together with various thoughts and ideas about Russia and her Empire. Tory Historian has not read it yet but it is generally described as being rather dull and formal. Well, it would be, one supposes. 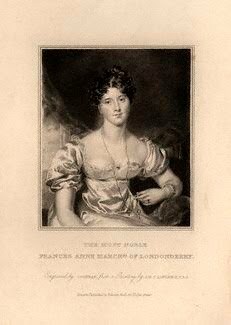 Lady Londonderry's diary, on the other hand, is delightfully informal and full of interesting information and rather catty comments as well as some realistic descriptions of roads, inns and Russian houses. Though it had been seen by various people and excerpts published here and there, the full volume was not in print till 1977. The Journal was edited by W. A. L. Seaman (Chief Archivist of Tyne and Wear Archives) and J. R. Sewell, who do not appear to like the lady or her husband. In the introduction, which is not as informative as one would like it to be (for instance, we never find out what possessed the Londonderrys to travel home through Poland, various parts of Germany and France in the worst part of the winter) they quote every disparaging reference they can find, though they also quote Disraeli's admiring one. In their anxiety to show up Lady Londonderry's ignorance or silliness they make several mistakes in the notes. On the other hand, it is the Journal itself that is worth reading and marvelling over. It has been said that the 1920s and 1930s were the Golden Age of the detective story. Tory Historian has always found that rather hard to accept as all too many of those novels are either completely unreadable or utterly preposterous, such as the adventures of Colonel Gore. The same period may be said to be the Golden Age of the essay, short, long or full-volume length as H. Douglas Thomson's Masters of Mystery is. Mr Thomson also edited a collection of Mysteries in 1934, which included every well known name and some rather unexpected ones. Mr Thomson writes with a ponderous and elaborate with that is very much of the period but one that many a literary undergraduate has attempted then and since. If the reader can get beyond that, there is a good deal of interesting information and acute analysis in the book. Overwork means undue congestion of certain lobes of the brain. In order to draw the blood from these lobes, other contiguous lobes must be stimulated. A week in the country merely means that you brood on your work. Detective novels act like iodine on a gum and serve as counter-irritant. Tory Historian has to admit that the pseudo-medical explanation is not very impressive but any excuse to read detective stories is a good thing. Tory Historian has been a little remiss with postings recently so an early new year resolution is in order. In the meantime a very Merry Christmas to all readers of this blog. Tory Historian admires Daniel P. Moynihan for many reasons, not least for being the sort of Democrat that seems to be extinct now. This quotation that dates back to 1969 merely confirms that. Of course, he uses the word "liberal" in the modern American sense. A true old-fashioned liberal has a very healthy skepticism of anything to do with government, particularly its claims to do good. One can pick up very interesting and somewhat random information from detective stories. Tory Historian was re-reading Dorothy L. Sayers' novels and, indeed, reading her essays. One of the early Wimsey novels was The Unpleasantness at the Bellona Club, whose plot revolves round the problem of who died first, General Fentiman or his sister Lady Dorland. The General's body is discovered in the Bellona Club in the early evening of November 11. Wimsey is asked to find out when he had died but immediately discovers a number of odd facts. He cannot find a single club servant who had seen the general come in on the morning of that day. But there is something else. Wimsey looks at the general's clothes as sent back to his flat and is surprised to find something missing: a poppy. It is inconceivable, he argues correctly, for someone like General Fentiman to walk about on November 11 without a poppy. However, it is obvious that he does not expect the general or, presumably, anyone else to be wearing a poppy on November 10. Clearly, the habit of wearing the poppy for weeks before actual Remembrance Day developed somewhat later than 1928. On the whole Tory Historian would prefer not to have the picture of London's Mayor at the top of this website. The organization, the King James Bible Trust, is entirely praiseworthy and TH hopes that many readers will look at the site, bookmark it and note whatever events it organizes to promote a wider knowledge of the book that changed the Anglosphere's understanding of the world and religion. Can one really think English-language literature or politics without the King James Bible or, as it is often known, the Authorized Version? Each month on average 450,000 people around the world use Google to search for "King+James+Bible", yet only 40,000 of those searches (fewer than 10%) originate in the UK. TH suspects with a deep sigh that it is not because everything about the subject is known to everybody in this country. One publication to mark the forthcoming anniversary is by the eminent historian Gordon Campbell. It is entitled Bible: The Story of the King James Version 1611 - 2011 (reviewed in the Guardian here), a highly entertaining as well as scholarly volume. Among other things, Professor Campbell writes about various editions, which varied from each other until a master text was published in 1769. Before and after that event there were editorial and printers' corrections as well as some highly entertaining misprints. In the first edition of the KJV designed for private study (1612), as opposed to reading aloud in church, Psalm 119:161 read "Printers have persecuted me without cause": "printers" was a misprint for "princes". Maybe so. But anybody in the writing and publishing business would have agreed with the unfortunate psalmist. The King James Bible is usually described as the only example of a committee (of scholars in this case) producing something very fine. Its publication was, as it happens, also a political event of great importance. So, perhaps, it is appropriate that there should be the picture of a living politician on the website. The earliest use of firearms in a battle? Tory Historian was fascinated by this news item about archaeological excavation at Towton in Yorkshire, the site of one of the bloodiest battles on English soil, fought between the Yorkists and Lancastrians in 1461. There are the usual arguments about the numbers killed and whether it was worse than Marsden Moor of the Civil War. But that is not the fascinating news. It would appear that archaeologists together with a metal detectorist [sic] have found bronze barrel fragments and very early lead shot. This will, one hopes, be followed up but obviously the discovery changes a number of military historians' calculations about when firearms started replacing bows and crossbows. But Sutherland [lead project archaeologist according to the article] is nevertheless unequivocal when it comes to the battle changing the course of English history. "Everybody has heard of King Richard III and if it hadn't been for Towton, won by his brother who died early, he would not have taken the throne," he said. Errm, no, not exactly. The Yorkists might have won the throne anyway and Henry Tudor was not that bothered which king he was to overthrow with this French troops. I am now rounding up all possible contributions for the Conservative History Journal (with many thanks to those who have sent theirs). So, any more?